Comparing Chia, Hemp and Flax Seeds - Which One Is Better? Comparing Chia, Hemp and Flax Seeds – Which One Is Better? Chia, flax seed and hemp hearts have become very popular among consumers and health enthusiasts in the recent years. All 3 products are vegan friendly and gluten-free (safe for those with Celiac Disease). Whether you sprinkle them in your yogurt, cereal, salad, shake, or baking the nutritional content of these products may provide some health benefits. So which one is best? The answer is: it depends on what health benefit you are looking for! Looking for more articles and videos? 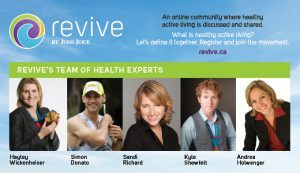 Join Hayley Wickenheiser, Kyle Shewfelt, Sandi Richard, Simon Donato and me at www.revive.ca, an online community where healthy active living is discussed and shared.